On Tuesday, November 20th, Claas Wilke will present recent results from the QualiTune research group at the Eclipse Demo Camp in Dresden. The demo camp takes place at the TU Dresden, Fakultät Information and starts at 7:00 PM in room INF/E023. Claas Wilke will talk on qMark, our new energy profiling infrastructure for Android applications. As the Eclipse Demo Camp is mainly designed for demonstrations, the talk will focus on a demonstration of the Eclipse-integrated profiling tools of qMark. Further information on the Eclipse Demo Camp and the program can be found at http://wiki.eclipse.org/Eclipse_DemoCamps_November_2012/Dresden. The slides of the talk are now online available via this link. At March 17th and 18th 2012, the Linux Days 2012 (Linux-Tage) will take place in Chemnitz, Saxonia. Within the workshop section the QualiTune team will present the NaoService as an approach to expose the Nao’s API as a Web service. This allows for easy integration within to distributed application scenarios or other software applications communicating with or controlling Naos. The presentation will be held in room V2 (Hörsaal- und Seminar-Gebäude der Technischen Universität Chemnitz, Reichenhainer Straße 90) on Saturday, 17th March at 5:00 PM. More information regarding the presentation and a German abstract can be found at http://chemnitzer.linux-tage.de/2012/vortraege/1016. On Thursday, January 19th, the Java User Group (JUG) Saxony will have an event at the Technische Universität Dresden, Faculty of Informatics. Whereas the main topic is about Android and the Open ADK, first, a short presentation will be held by Claas Wilke from the QualiTune team. He will present our Nao robots and will demonstrate, how their API can be exposed as web services and use to remotely controll Naos via applications, e.g., for Android devices. The presentation starts at 7 PM, the exact location is INF/E023. More information regarding the event and the JUG Saxony can be found at http://www.jugsaxony.org/. The slides of the talk are now online at http://www.jugsaxony.org/wp-content/uploads/2011/11/NaoAsAService.pdf. At Tuesday, November 2011 another Eclipse Demo Camp will take place at the Technische Universität Dresden, Faculty of Computer Science, Room INF/E023. One of the presentations will be held by Claas Wilke who will demonstrate a first prototype of our textual programming language for Nao humanoid robots, called NaoText. Besides NaoText we will demonstrate how such a language can be extended by analysers for energy consumption and real-time behavior analysis. Further infos regarding the Eclipse Demo Camp can be found at http://wiki.eclipse.org/Eclipse_DemoCamps_November_2011/Dresden. At the 1st of July we gave talks to the public about cyber-physical systems and presented „Chuck“ – our Nao robot, which we controlled by an Android smartphone using our tools: NaoDroid and NaoService. We are thankful for having had such a huge, excited audience ranging from young children to seniors. Again, we have been on regional television (MDR Sachsenspiegel). You can watch the video on Youtube: Dresden laedt zur Wissenschaftsnacht. 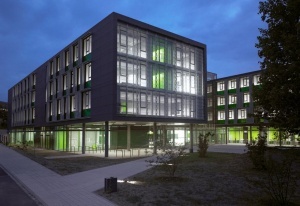 At July, 1st 2011, the 9th ‚Lange Nacht der Wissenschaften‘ takes place in Dresden, where several research institutes are open for interested people and present themselves to the public. Participating, the research group QualiTune will have two presentations in the Faculty of Computer Science, Nöthnitzer Straße 46, Room INF/E08 at 7 PM and 9 PM. The topic of both presentations will be a general introduction into Cyber-Physical Systems. Both talks will be held by Sebastian Götz.